Behind the shaped iron gate a dusted road bordered by tall stone columns runs: it cuts in half a large orchard with thick trees of dark green leaves. An ancient Romanesque church of the ninth century enjoy the view. 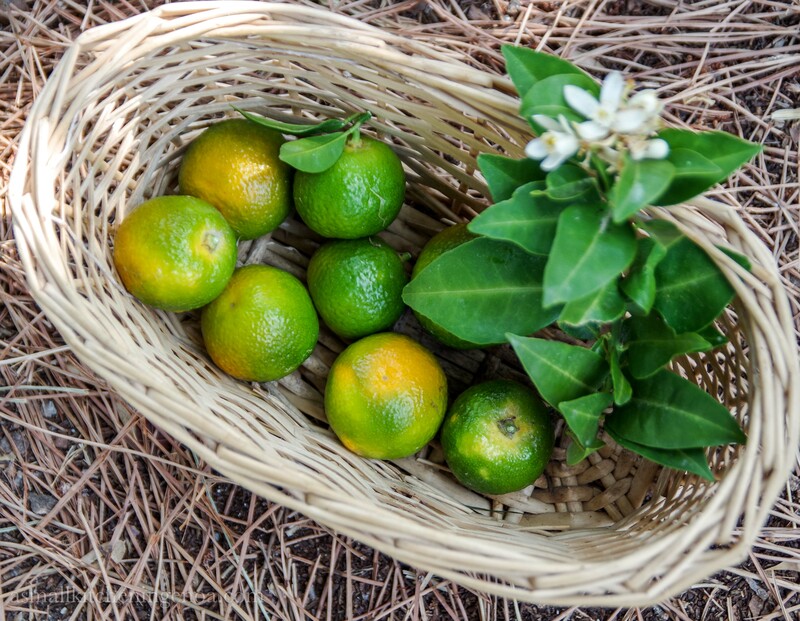 It is sufficient to look out on the threshold to feel a sweet scent of orange blossoms, while it is essential to enter in order to notice among the thick branches of the trees large clusters of bright green spheres almost perfectly camouflaged. They are chinotto oranges, chinotto oranges from Savona to be precise. 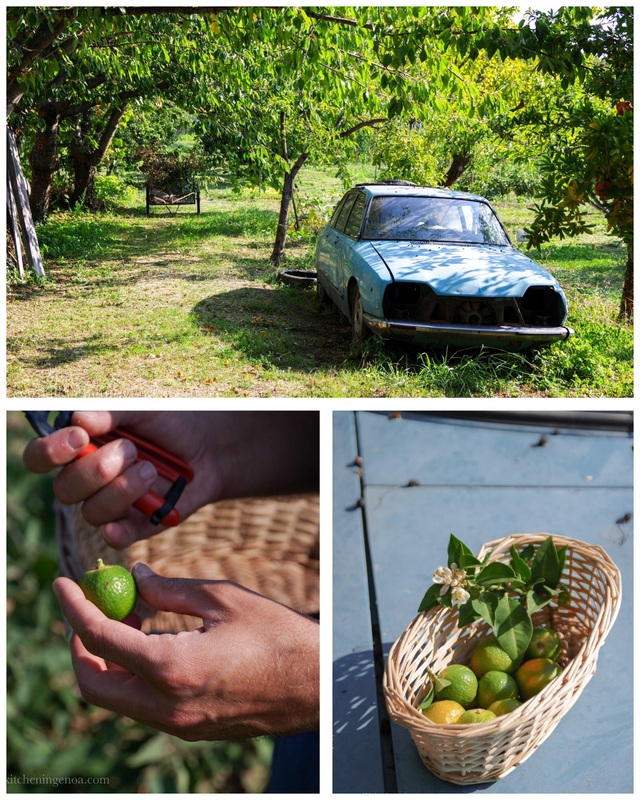 It’s the end of September (yes I know, the gestation of this post was quite long …) and I’m on the edge of the lands owned for generation by the family Luca Ottone, one of the youngest chinotto’s farmer in the Italian Riviera. 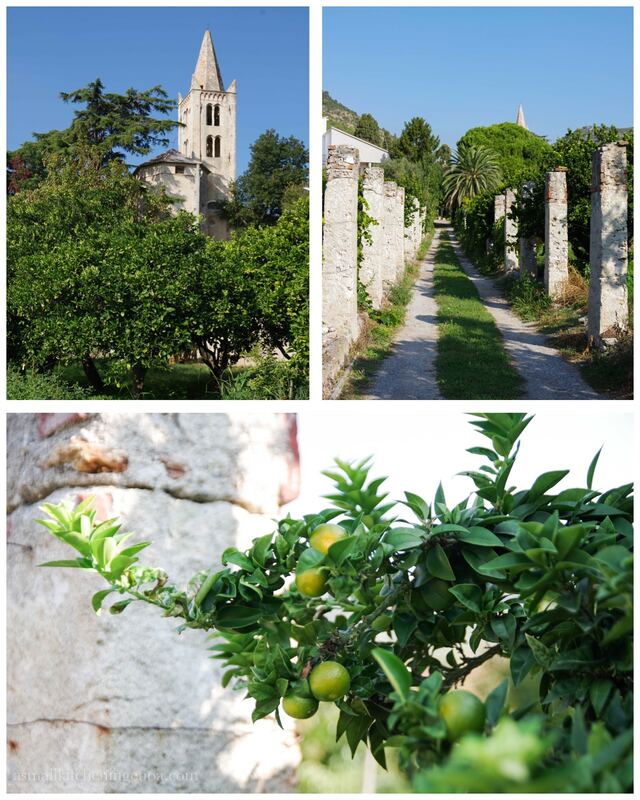 I come to visit him to discover this very special local citrus, since 2004 protected as a Slow Food Presidium of Liguria. Luca welcomes me smiling and enthusiastically takes me for a walk in his orchard and starts telling me about his plants, which by the way are the oldest of the entire Slow Food presidia having something more than a hundred years. First of all, he tells me that recent studies have shown that chinotto is one of the very few citrus originating from the Mediterranean coasts. In fact, it would be the result of a local genetic mutation of bitter orange, a citrus, like many others, originating of China and come to us only in the early Middle Ages. Perhaps imported on the Ligurian coasts by some farsighted merchant, chinotto has found in the province of Savona – and more precisely in the extremely limited area that goes from Varazze to Finale Ligure – a perfect habitat so as to acquire over the time very special organoleptic properties that distinguish it from the other chinotto plants grown in Italy (including for example very high values of vitamin C). 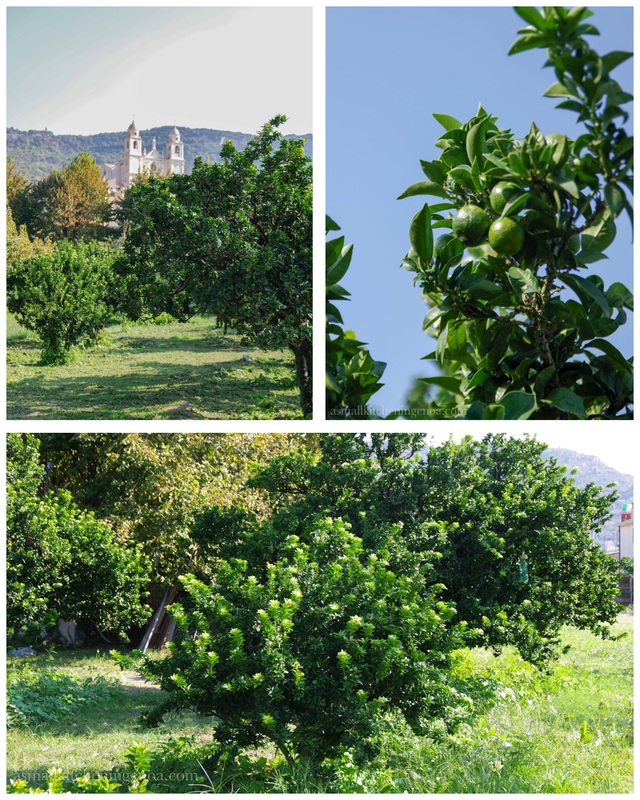 The Savona chinotto is a plant that reaches up to 3 and a half meters in height, although to facilitate the collection of its fruits it is generally kept lower. Its lance-shaped leaves are reminiscent of myrtle ones, although larger, and this is why it is called in botanical Citrus Myrtifolia. The fruits, so small to fit in a hand, are collected from the end of September to the end of November. They are generally collected when they are still bright green. This is in fact the point of maturation in which the fruit has the best organoleptic and aromatic characteristics. With the turning towards yellow / orange, instead, the special properties are gradually fading so much that the use in this case is limited mainly to the preparation of preserves. 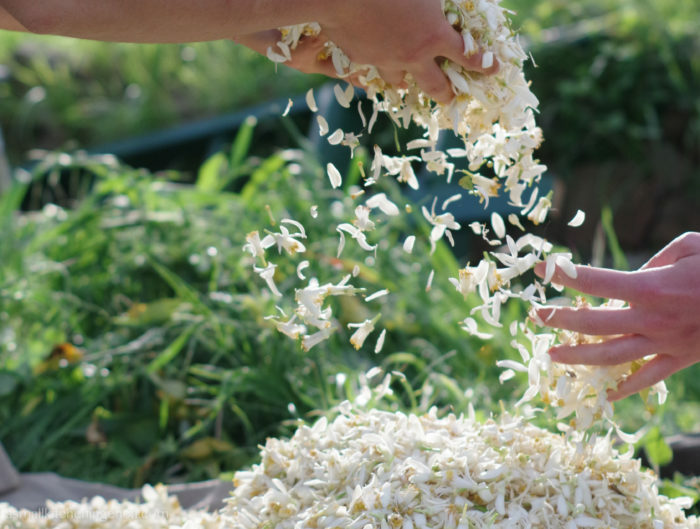 They are collected strictly by hands, one by one, with the help of small scissors with which the peduncle is severed (it must strictly remain attached to the fruit to prevent it from sweating too much or rotting more quickly after harvesting). The freshly picked chinotto oranges have a very bitter taste and are practically inedible. So why their cultivation and processing, especially around Savona, has been so prosperous since the last century? 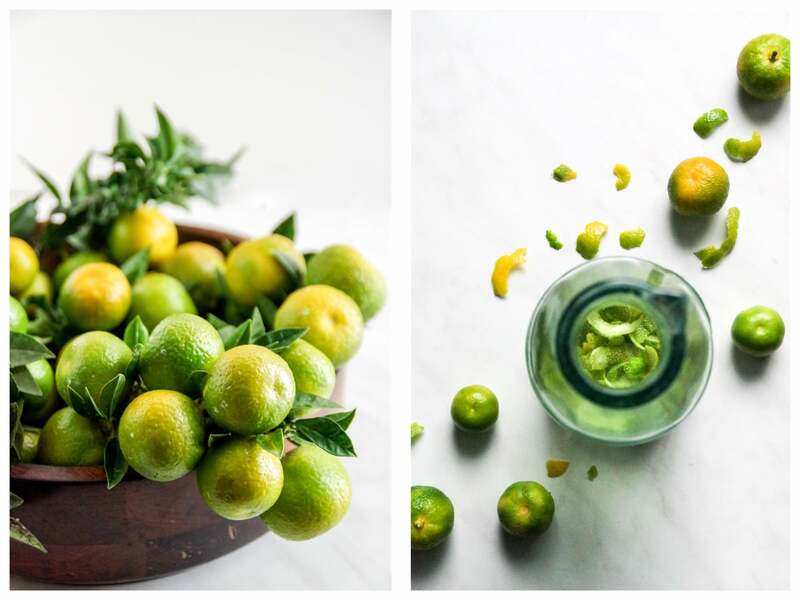 Pietro explains that initially this citrus – very rich in vitamin C – was widely consumed on board ships as a remedy against scurvy. Being very small, in fact, it managed to be keept in brine (or in barrels full of sea water) much longer than other larger citrus. It is said that Elizabeth the 1st ‘s English fleet defeated the Spanish Invincibile armada at the end of the 16th century precisely because the English sailors were more robust and healthy thanks to the consumption of chinotto oranges. Whether it is true or not, it is a fact that until the beginning of the 1900s, the chinotto was sold as an invigorating medicine to the French, British and Russian navy. In the nineteenth century, then, the art of candying (imported from France) turns the chinotto from a bitter medicine into a refined confectionery product. “Hard skin, tender heart” was the joke that accompanied then the candied chinotto oranges. And in fact, a fragrant bright green peel resistant to the bite, when it finally gives in, reveals a soft pulp, exquisitely bitter and sweet at the same time. A refined but also trendy sweet: between the late nineteenth and early twentieth century, during the Belle epoque, in fact, there was no trendy café on the Côte d’Azur and Italian Riviera that did not flaunt on the counter large jars containing candied chinotto orages preserved under maraschino, to be served as an aperitif. The cultivation and processing of chinotto thus flourished between Varazze and Finale until the 1920s. Then it came into crisis both for economic reasons – margins of profitability were too low compared to other crops – and due to two great frosts (in 1929 and 1959) that killed most of the existing plants. 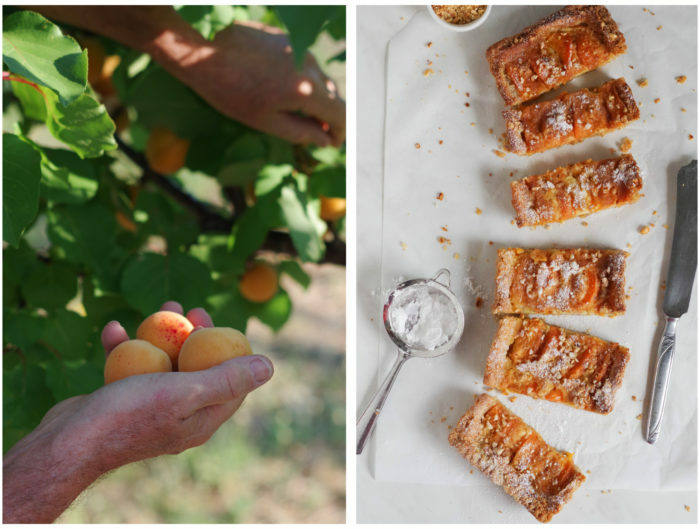 When Slow Food arrived in 2004 to revive the chinotto, the plants grown in the plain of the province of Savona were a few dozen. Today they are a few hundred. Many people trust in the great potentials of this product, although probably – due to its low profitability – it will remain a niche product for great connoisseurs. Then there is chinotto jam. My great discovery. I made it with the slightly yellow chinotto oranges bought by Luca and I used his mother’s recipe. The taste, so special, recalls the bitterness of grapefruit and the sweetness of mandarin. I used it to prepare a sweet focaccia, to fill a shortbread cake and several times to accompany aged cheeses (my favourite use). Still with Luca’s chinotto oranges, I then prepared the famous “chinottino”, the liqueur of chinotto. The preparation is the same as the limoncello (for 1 liter of alcohol the peels of 5-6 fresh green chinotto oranges are required) and similar taste, except for the more bitter notes typical of this citrus and for its remarkable digestive properties. Another product very trendy at the moment is the chinotto mustard, even if I have not tried it, as well as chinotto under syrup. And again, do not forget that the aroma of chinotto characterizes the famous soft drink that bears its name, “Chinotto”. 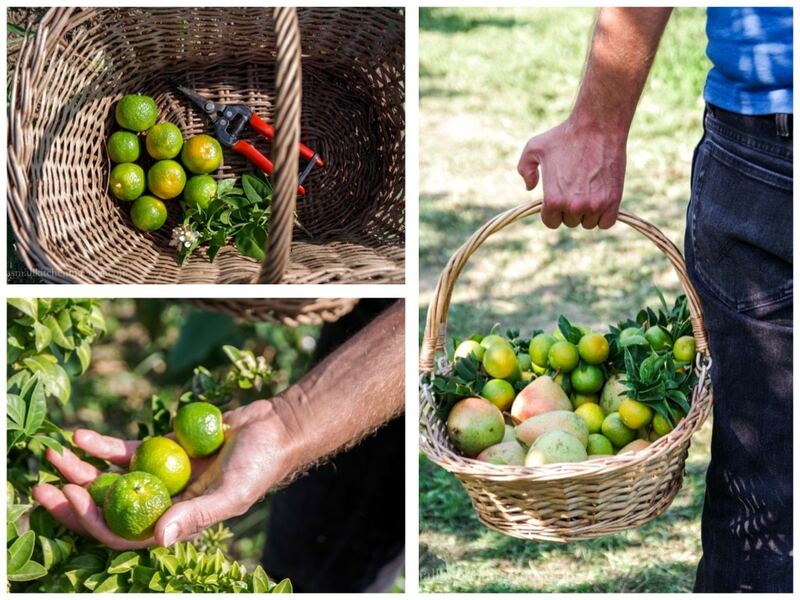 If you want to deepen the story of Chinotto soft drink, of the origin of Chinotto oranges or of Chinotto features, you can visit the website of the network Il Chinotto nella Rete. This network groups all the companies of the Savona area that work, processe and market Chinotti or Chinotto based products. 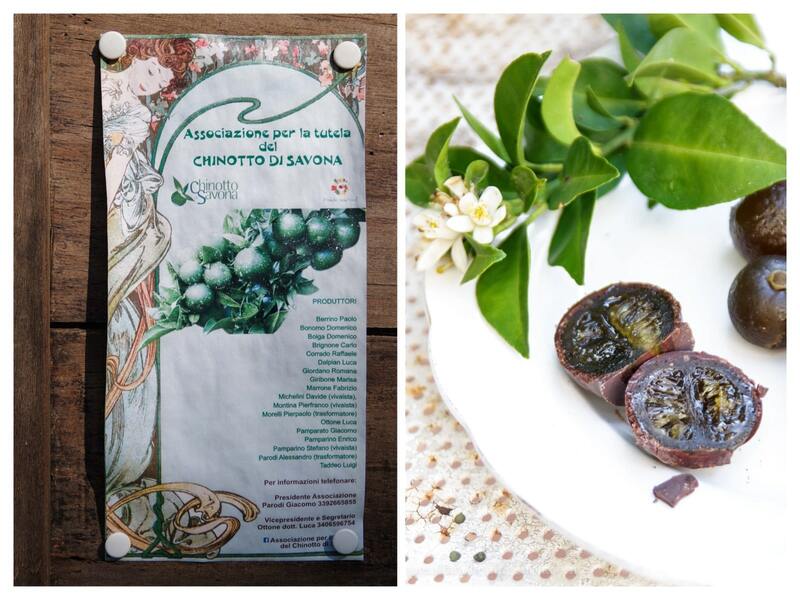 Are you curious about the other Liguria Slow Food Presidia? 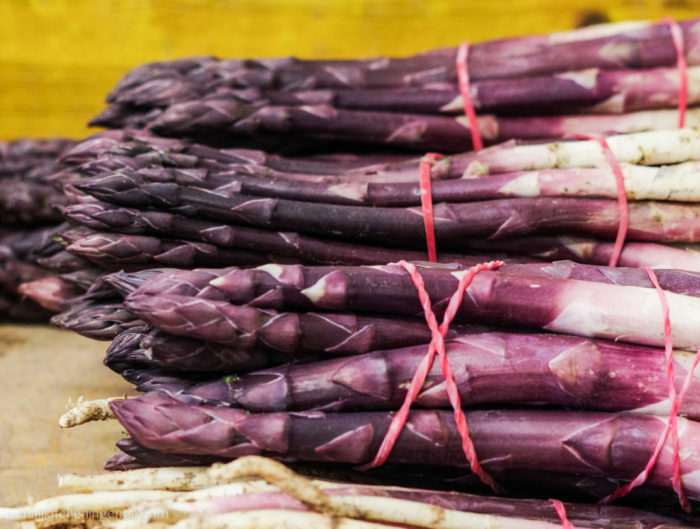 Here on the blog I tell you the stories of Bormida dried chestnuts, of Albenga violet asparagus, of bitter orange blossoms water, of Pigna white beans, of Valleggia Apricots and of Vessalico garlic. Did you like this post? Don’t miss the next ones!